You can now export all the data required for troubleshooting in an easy and safe way. The export includes the XPub, your transaction history, the configuration of Exodus (enabled assets, localization, etc...), and your exchange order list. Click on Help in the bottom left hand corner of the wallet. 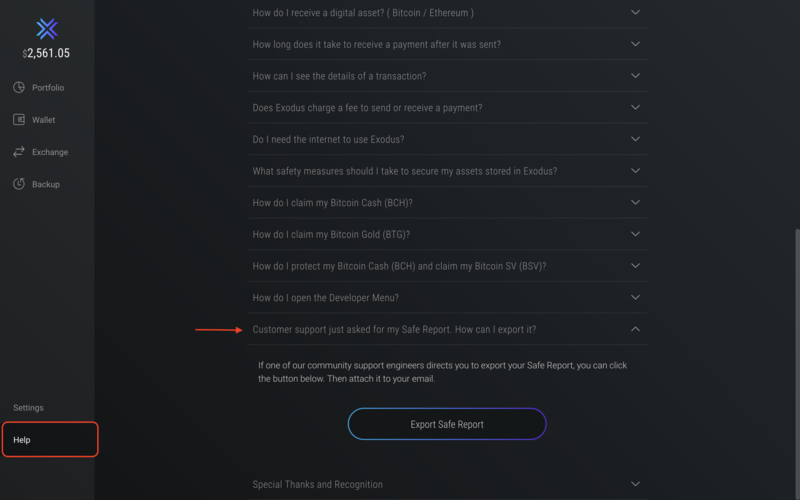 Scroll down until you find "Customer support just asked for my Safe Report. How can I export it?" and click on it. Click the "Export Safe Report" button. I exported my Safe Report, but now I can't find It? After clicking on the button, a zip file named "exodus-report-SAFE-(Date+Time).zip" will appear on your Desktop, in a folder named "exodus-exports". Simply attach it to your email response with an Exodus customer support engineer! The XPub Key or "Extended Public Key" which allows us to view your full wallet history. It is a collection of your public keys - your private keys are not included. The transaction history which is useful to make sure all deposits were properly credited to your Exodus wallet. This also gives you the peace of mind to make sure your wallet balance is correct. The configuration file shows the version of Exodus you are using, the first version installed and lists the enabled assets in your wallet. This can be useful for troubleshooting with the support team. Exchange order list allows us to comb through all your exchange orders. This can be useful when you had a failed exchange. The safe export option does not give us (or anyone else) control over your wallet. This data will allow our support team to help you better and without compromising your wallet. The Safe Report lets us inspect your wallet activity. While the exported zip file is not as important or sensitive as your private keys, we recommend deleting it and emptying your trash or recycle bin after sending it to us. Anyone who has it can fully monitor your wallet activity on the blockchain.